A little bear cub explores the world with its mother and discoveres many huge and wonderful things. But in answer to the question 'Is that the biggest thing in the world?' the answer is always 'no'. At the end of the day, little bear wants to know what the biggest thing really is and finds out that it is love. This reassuring picture book stars an adorable cast of wide-eyed animals, illustrated by Melanie Mitchell, which are sure to appeal to children and the grown-ups who share this story with them. Scottish author Kenneth Steven is the author of The Sea Mice and the Stars, a picture book which was chosen as the runner up in the inaugural 2005 Royal Mail Awards for Scottish Children's Books. As a little polar bear cub explores with his mother, he discovers many huge and wonderful things. Each object is bigger than the last, and the cub always asks his mother: "Is that the biggest thing in the world?" But each time his mother answers, "No." After much exploration, the cub eventually finds out that the biggest thing in the world is love. 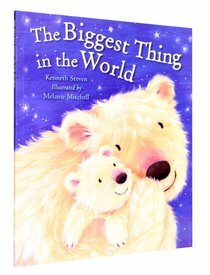 About "The Biggest Thing in the World"
MELANIE MITCHELL has published several novelty-book series in England and the United States. This is her first board book to be published with Walker and Company. She lives in Wales.